Thunder Power RC « Big Squid RC – RC Car and Truck News, Reviews, Videos, and More! You are browsing the "Thunder Power RC" category archive. Thunder Power RC has a couple new sensored brushless motors for 1/8 scale offroaders! Available in 1400Kv, 1900Kv, 2100Kv and 2400Kv ratings, these things are sure to make your buggy scream. Sporting easy-to-set 0-25 degree timing and a 4-Pole neodymium rotor; they even have a sweet warranty and replacement program. Check out all the specs at ThunderPower.com! News from Thunder Power RC reports that their pro guy, Paul Lemieux has won the Invitational Class at the 2010 Reedy Race of Champions. Congrats Paul! 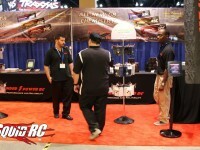 Head over to the Thunder Power RC site for all the details!